America certainly has popularity problems – despite spending billions of dollars – among the nations in the Middle East and north Africa, but it took Wednesday’s uprising in Egypt, in which a Muslim Brotherhood-linked president apparently was taken down, to reveal the full extent of dislike of America’s president, Barack Obama. 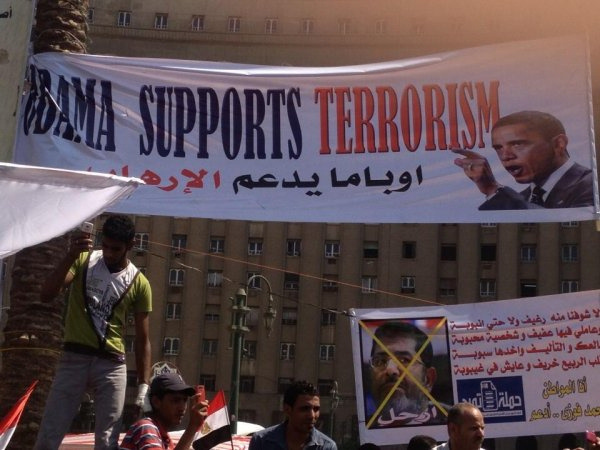 “Wake Up America Obama backs Up a Fascist Regime in Egypt,” declared one banner. “Obama Supports Terrorism,” said another. The U.S. and Egypt long had been on friendly terms under former President Hosni Mubarak. However, as part of the Arab Spring movement that claimed it was in pursuit of freedom but actually installed radical Muslim elements in power in several nations, he was ousted at Obama’s encouragement. Muhammad Morsi, with all his links to the radical Muslim Brotherhood, was installed as the new president a year ago. 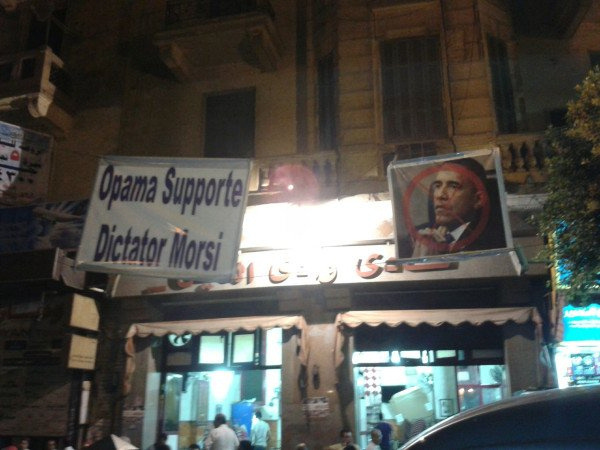 But now the U.S. has taken a hands-off attitude, and Morsi apparently was challenged by his own military. No matter who calls the shots for the next weeks or months, it is expected Egypt will be in turmoil. 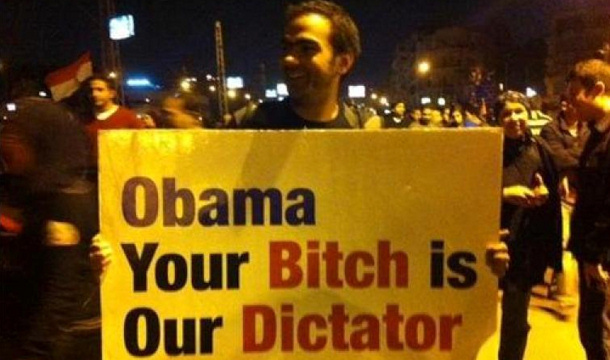 But a series of images assembled by blogger Doug Ross reveal the strong Egyptian perception that Obama has been interfering with the plans and hopes of Egyptian people. A report in the New York Times said as night fell over Egypt and the military appeared to take control that things were in disarray. While Gen. Abdel Fatah Said Al-Sisi made an announcement that the constitution was suspended, elections would be scheduled and the constitutional court would take charge during the transition. He also confirmed there would be changes to what Morsi had imposed. There were reports that nearly 20 people had died and hundreds were injured in the public square protests, while cars were burned, garbage was left smoldering and makeshift barricades and torn books littered the ground. Tom Blumer at Newsbusters explained that the old-fashioned media –newspapers, networks and the like – were ignored the anti-Obama element in the dispute. “I predicted with little risk of being wrong that the existence of this banner would not ‘survive future AP reports’ – and it hasn’t,” he wrote. Some of the images of anti-Obama signs date back to late 2012, but others are undated and appear to be from the recent rallies.